Gierach earns third place in Microsoft certification - Hamilton School District. 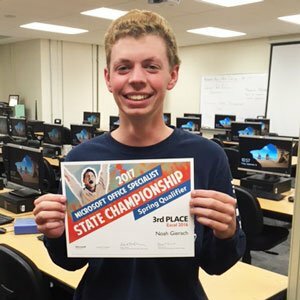 Hamilton High School 2017 graduate Noah Gierach recently learned that his score was the third highest in Wisconsin for the Excel 2016 Microsoft Office Specialist Certification exam. Gierach took the exam last year when he was a student in Toni Hillmann’s Computer Application class. Hamilton began participating last year in Microsoft Imagine Academy, a nationwide program that allows schools to offer fundamental technology skills training and rigorous technical courses for students who are interested in pursuing a career in information technology after graduation. Microsoft provided a grant that allowed Hamilton to participate in the program. Imagine Academy is a complete technology education solution connecting staff, teachers, students, employers and local communities through leading-edge technology skills development that leads to industry-standard certifications.